Our range of outward opening wooden bi-folding patio doors have been developed to be durable and high performing. The bi-folding doors, also known as folding sliding patio doors, can be configured to suit a wide range of sizes, designs and layout options to suit the opening within the property and the layout of the room. A hybrid timber and aluminium cill is incorporated into the door as well as draught seals to provide enhanced weather performance. The wooden bi-folding patio doors also benefit from low resistance sliders and multipoint locking as well as shoot bolts to provide enhanced security performance. Choose from a range of glazing, timber and paint options to achieve the design that you require, all offering our Warmlite 10 year industry leading guarantee. Weather Sealing The use of draught seals on the door leaves and within the track ensure that all parts of the doorset are well sealed, providing excellent protection from the elements. Multipoint Locking & Shoot Bolts The outward opening doorset uses easy to operate shoot bolts on the top and the bottom of the door to lock into position (these can be specified with key operated locks). The master door is supplied with a multipoint lock providing excellent security. Low Resistance Sliding The effortless movement of our doors is achieved by using the best hardware systems available. These systems enable our doors to have the best operation method, the latest innovations and the highest quality parts. All Warmlite timber bifold door installations are covered by our 10 year guarantee. This gives you the peace of mind that in the unlikely event something should go wrong with your wooden bifold sliding, you can get them fixed quickly and conveniently at no cost to you. The guarantee covers material defects in profile materials, panels and glass units. 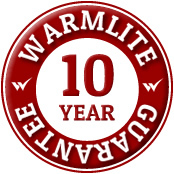 In the very rare event that a problem develops with your timber bifold doors during the ten year period, Warmlite will simply replace the affected product. Warmlite use certified Redwood Woodheart® as standard for our wooden bifold doors. We also have a range of hardwoods and Accoya modified timber to choose from. For further information about our beautiful bifold sliding doors, a free site survey with a no obligation quotation or to arrange an appointment.